Reactwell has developed a clean water technology that utilizes a novel material science innovation to eliminate the use of expensive metals, such as titanium and stainless steel, as well as membrane systems when working with industrial waste water, petrochemical waste water and upstream oil & gas industry waste waters. 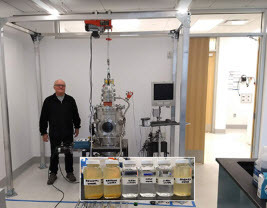 Reactwell collaborated with PIs at The Department of Energy (DOE) National Laboratory System to develop the technology. The clean water technology materially reduces Biological Oxygen Demand (BOD), Chemical Oxygen Demand (COD), Total Dissolved Solids (TDS) and Total Suspended Solids (TSS) as well as other contaminants found within industrial waste water, petrochemical waste water and oil & gas produced water. Reactwell’s clean water technology was recently licensed to a water service company based out of Louisiana and another industrial site based out of California.